This dependable battery ( with a 4 year replacement guarantee) is the key to operating your Powerheart G3 Defibrillator. Get years of reliability with a 4-year performance guarantee and the superior battery capability of a lithium powered energy source that requires no memory or scheduling cycling to ensure battery life. The Intellisense Lithium Battery is tested thoroughly by manufacturers, and tested each day after it has been installed in your Powerheart G3 Defibrillator, so that you can be confident that your equipment will always be ready to operate. Intellisense Lithium Batteries have an integrated memory chip that continually stores vital usage information, allowing the battery to hold the entire history of its operating life. With RescueLink software this the Intellisense Lithium Battery history can be reviewed. 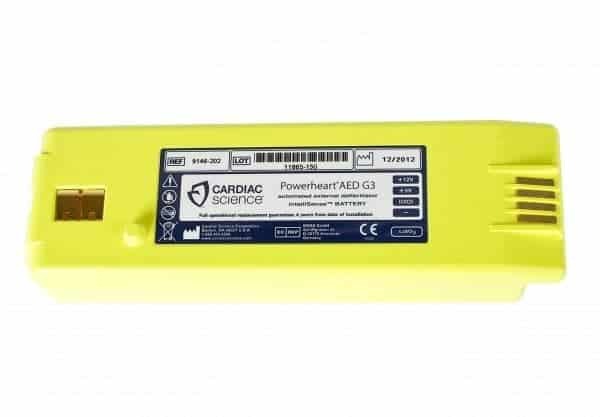 This history includes: – Battery Identification – Battery Type – Original Date of Installation in an Defibrillator – Number of Charges completed – Time in Operation (hours:minutes) – Days of Standby Operation – Battery Capacity Remaining Having a reliable Powerheart G3 Defibrillator is not just a matter of convenience, it could be the difference between life and death. If you own a Powerheart G3 Defibrillator you have obviously identified the very possible risk of sudden cardiac arrest to you, your loved ones or your colleagues. Sudden cardiac arrest is the leading killer of Australians, with a survival rate of just 2%-5%. It does not discriminate between the young and the old. Sudden cardiac arrest occurs when the heart stops beating normally and thus a victim’s blood stops flowing around the body to power the brain and vital organs. This malfunction in the heart’s electrical system can be termed as ventricular tachycardia (rapid rhythms) or ventricular fibrillation (chaotic rhythms). With the heart muscle spasming rather than pumping, blood is not pushed through the veins and arteries. It is essential to apply electrical shock to the heart in order to reinstate the normal heart beat as soon as possible, as after falling unconscious from sudden cardiac arrest there is 4-6 minutes before brain death and other terminal damage to the body. 95% of sudden cardiac arrest victims will die before they get to hospital and so your Powerheart G3 Defibrillator may be the element that saves someone’s life. Therefore, you need your Powerheart G3 Defibrillator to be ready to use whenever you need it. The medical grade Intellisense Lithium battery gives you the peace of mind that your Powerheart G3 Defibrillator will work at any time, even after sitting dormant for extended periods. Lithium powered batteries are safe, reliable and low maintenance. Lithium is the lightest of all metals, has the most electrochemical potential and the largest specific energy per weight. With self-discharge being less than half of nickel-based power sources, it is guaranteed that you battery will be ready to power your Powerheart G3 Defibrillator. No need to recharge or for your Powerheart G3 Defibrillator to be plugged into external power sources makes the Powerheart G3 Defibrillator portable, an investment that can be used anywhere at any time.